Osman Hamdi Bey (1842–1910), Two Musician Girls (1880), oil on canvas, 58 x 39 cm, Pera Müzesi, Istanbul, Turkey. Wikimedia Commons. 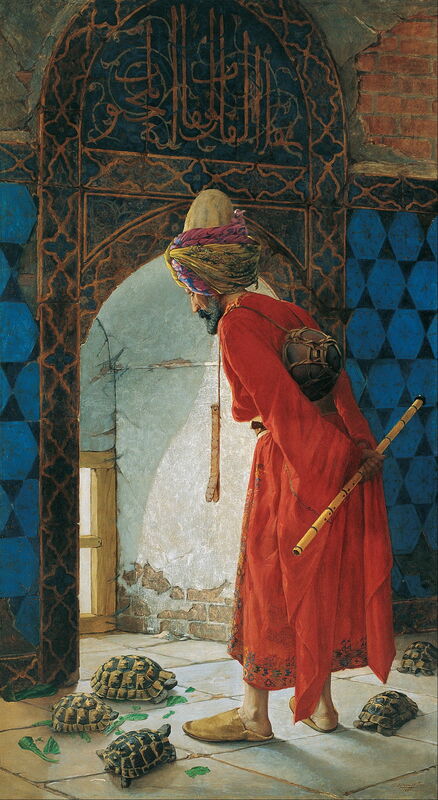 When researching my recent article about tortoises in painting, I came across the work of Osman Hamdi Bey (1842–1910), a polymath who was an administrator, intellectual, archaeologist, museum curator, and accomplished painter, and had significant influence over the formation of modern Turkey. Here are a few of his paintings. The son of the Ottoman Grand Vizier, the empire’s equivalent of Prime Minister, who was in office in 1877-78, he first studied law in Istanbul, then went to Paris to study in 1860. Although he had intended continuing to study law there, he switched to painting, and was a pupil in the studios of Jean-Léon Gérôme and Gustave Boulanger for the next eight years or so. He exhibited three paintings at the Exposition Universelle in Paris in 1867, although these and his other works from his years in Paris mostly appear to have been lost, apart from one painting which is now in the Musée d’Orsay. Hamdi Bey returned to Istanbul in 1869, where he married his first wife, a French woman, and was sent to Baghdad as part of the administration in what was then a province of the Ottoman Empire. Osman Hamdi Bey (1842–1910), Kökenoğlu Rıza Efendi (1871), oil on canvas, 51 x 41 cm, Pera Museum, Istanbul, Turkey. Wikimedia Commons. In 1871, he returned to work in the administration in Istanbul, where he painted several portraits, including this of Kökenoğlu Rıza Efendi (1871). Osman Hamdi Bey (1842–1910), The Scholar (1878), oil on canvas, 45.5 x 90 cm, Private collection. Wikimedia Commons. Most of his earlier works continue the highly-detailed salon style which he learned under Gérôme and Boulanger, as in his superb The Scholar (1878). Osman Hamdi Bey (1842–1910), Kuran Okuyan Kız (Girl Reciting the Qur’an) (1880), oil, dimensions and location not known. 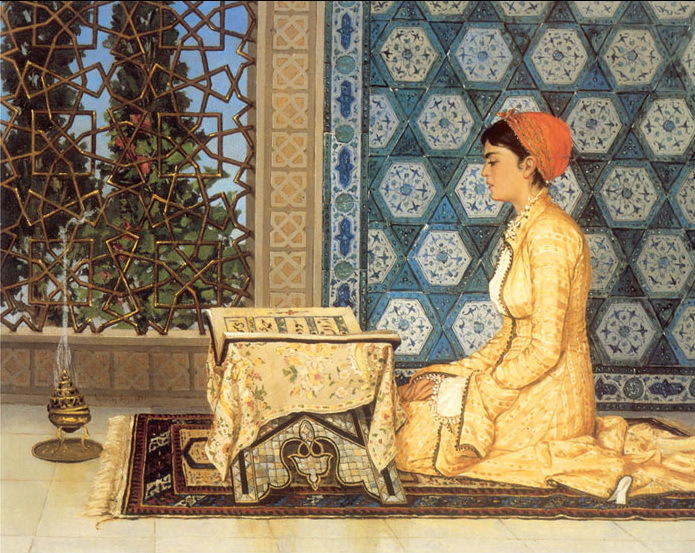 His paintings also usually feature finely-worked decor, including carpets, walls, and the sparse furniture of Girl Reciting the Qur’an (1880). Hamdi Bey seems to have painted many scenes showing women, which would have been quite unusual for that time in the Ottoman Empire. 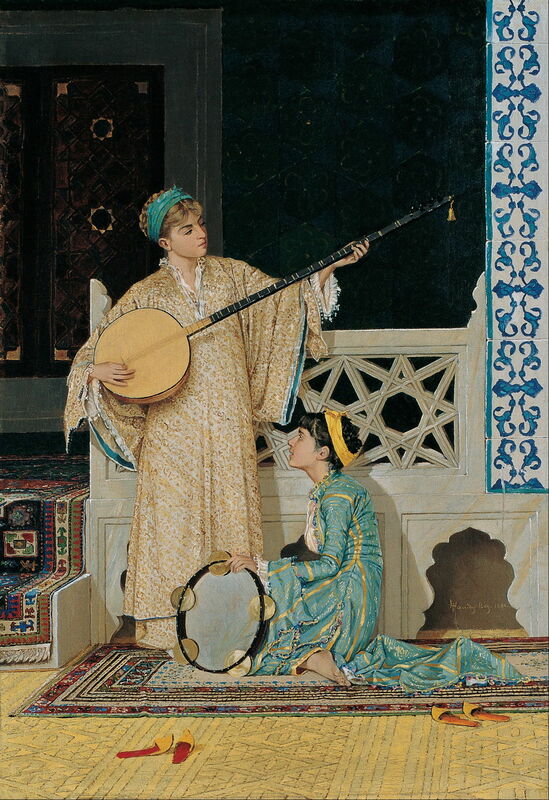 Two Musician Girls (1880) is particularly interesting for showing its figures with two traditional Turkish musical instruments. The large stringed instrument is a tambur, a member of the lute family which was plucked, and the large tambourine is a daf. In 1881, Hamdi Bey was appointed the director of the Imperial Museum, which kickstarted his career as an archaeologist, and his campaign to preserve the rich antiquities still in the Ottoman Empire. The following year he founded the Academy of Fine Arts, which was the first fine art school within the empire. Osman Hamdi Bey (1842–1910), Persian Carpet Dealer on the Street (1888), oil, dimensions not known, Alte Nationalgalerie, Berlin. Wikimedia Commons. The wonderful assortment of characters in his panoramic view of a Persian Carpet Dealer on the Street (1888) reflects the cosmopolitan population of Istanbul, sitting at the gateway between Europe and Asia Minor. Osman Hamdi Bey (1842–1910), An Arab Reading (c 1906), oil on canvas, dimensions not known, Alte Nationalgalerie, Berlin. The Athenaeum. Many of his paintings also feature beautiful Arabic and Persian calligraphic art, as shown in An Arab Reading (c 1906). His magnificent The Tortoise Trainer (1906) is by far his best-known painting, and set the record for the highest price paid for a Turkish painting when it was sold in 2004 for $3.5 million. Its ingenious allegory can be read in at least two ways. The artist may have been self-critical of his painstakingly slow work; tortoises are not only inherently slow, but in the early eighteenth century had been used in Istanbul to bear lit candles for evening outings. This painting also had a greater political meaning, as the tortoise trainer wears traditional Ottoman religious costume from before the middle of the nineteenth century, and is training the tortoises with a traditional Turkish ney flute. In that sense, it is a satire on the slow, faltering, and often ineffective reforms made to the Ottoman Empire during the late nineteenth century, an issue with which Hamdi Bey had much personal experience. This resulted in a time of increasing social and political upheaval, preceding the Young Turk Revolution of 1908 which changed the basis of rule in the empire, followed by the breakup of the empire after the First World War. 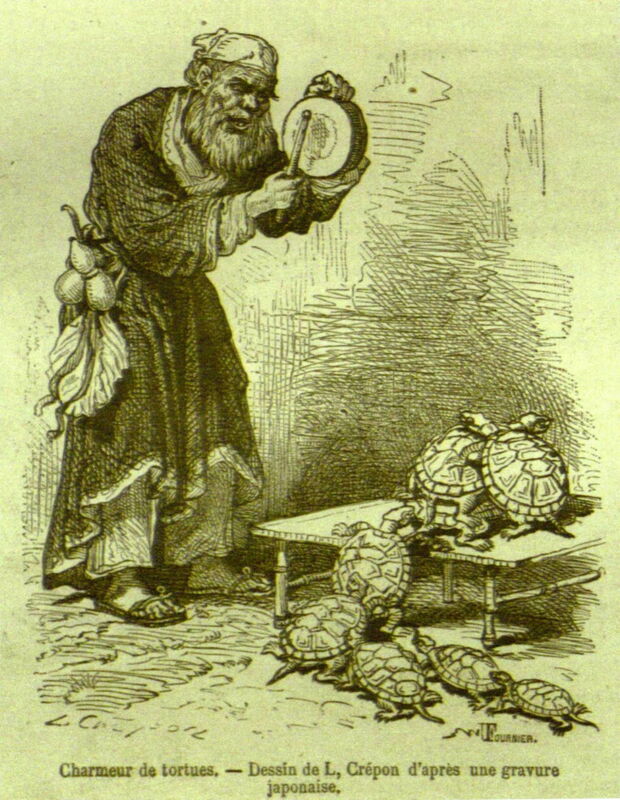 L. Crépon (dates not known), Tortoise Charmer (1869), print after a Japanese engraving, in Tour du Monde, further details not known. Wikimedia Commons. As I pointed out earlier, it has been proposed that Hamdi Bey was inspired by this print created by “L. Crépon”, of the Tortoise Charmer of 1869, which he may well have seen when he was still in Paris. Osman Hamdi Bey (1842–1910), Beyaz Vazoda Çiçekler (Flowers in a White Vase) (1910), oil, 58.5 x 71.5 cm, Sakıp Sabancı Museum, Istanbul, Turkey. Wikimedia Commons. His later paintings tended to use more gestural marks, although they never became particularly painterly. 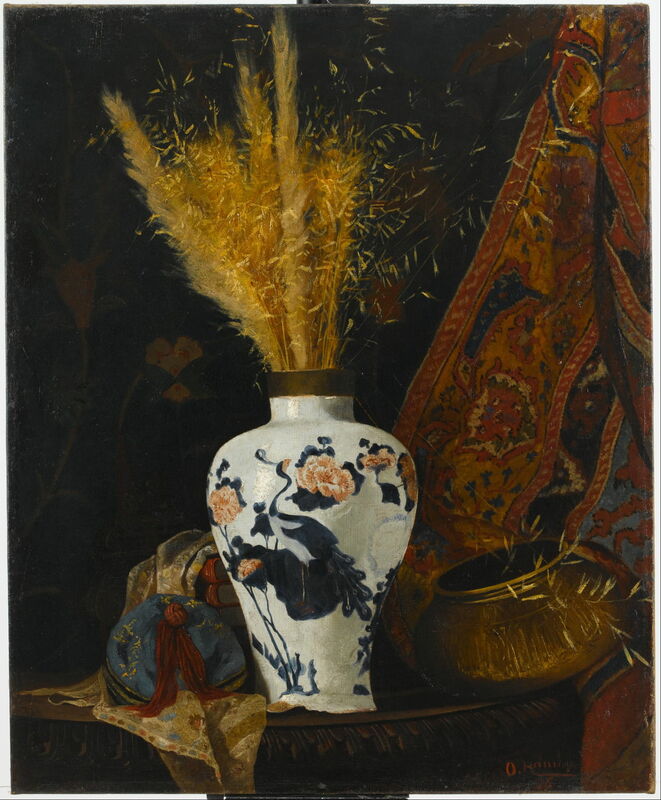 This is shown well in the grasses of his Flowers in a White Vase (1910). Osman Hamdi Bey (1842–1910), Naile Hanım Portresi (Portrait of Naile Hanım) (1910), oil, 41 x 52 cm, Sakıp Sabancı Museum, Istanbul, Turkey. Wikimedia Commons. 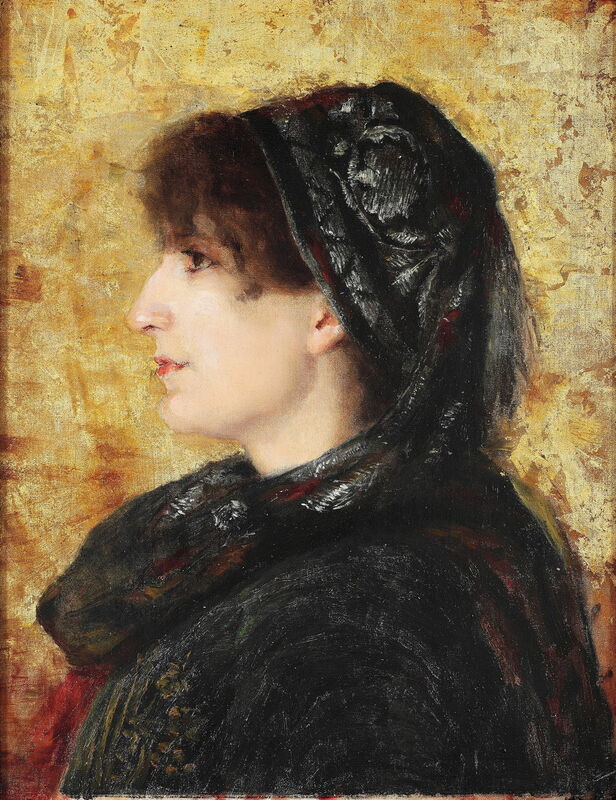 Portrait of Naile Hanım (1910) shows Hamdi Bey’s second wife, Marie, who was also French. He met her when visiting Vienna, and she later took the name Naile Hanım. Here his brushwork is more obviously painterly and gestural, particularly in her clothing, and the background. 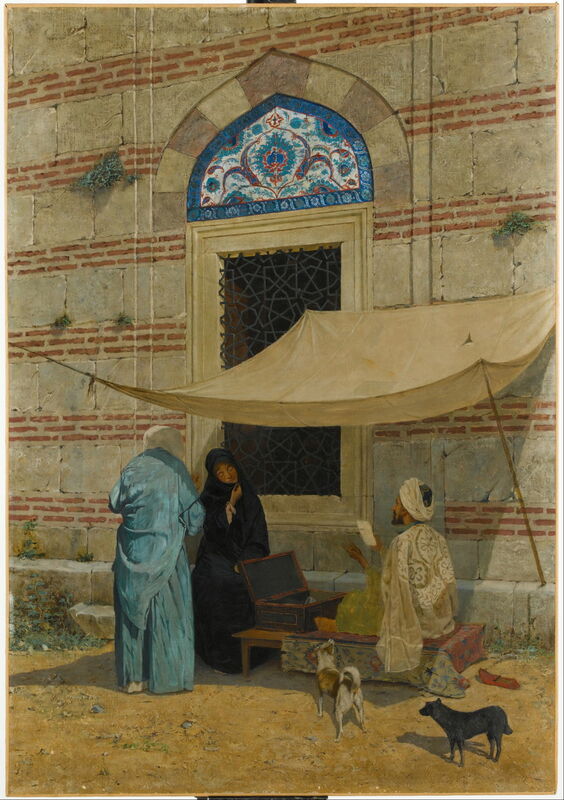 Osman Hamdi Bey (1842–1910), Arzuhalci (Public Scribe) (1910), oil, 77 x 110 cm, Sakıp Sabancı Museum, Istanbul, Turkey. Wikimedia Commons. Another familiar street scene of the day, Public Scribe (1910) may have been part of a campaign to improve education and literacy, particularly among women. 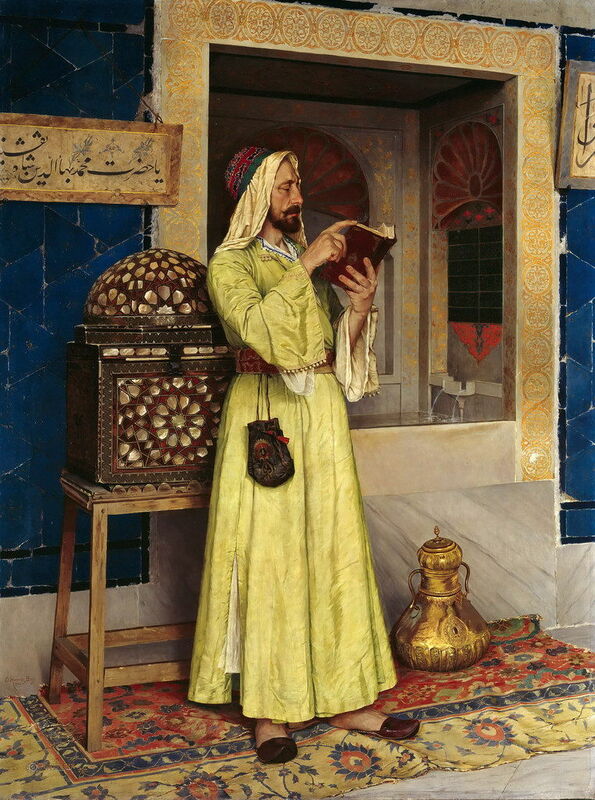 Osman Hamdi Bey (1842–1910), Kur’an Tilaveti (Reciting the Quran) (1910), oil, 53 x 72.5 cm, Sakıp Sabancı Museum, Istanbul, Turkey. Wikimedia Commons. 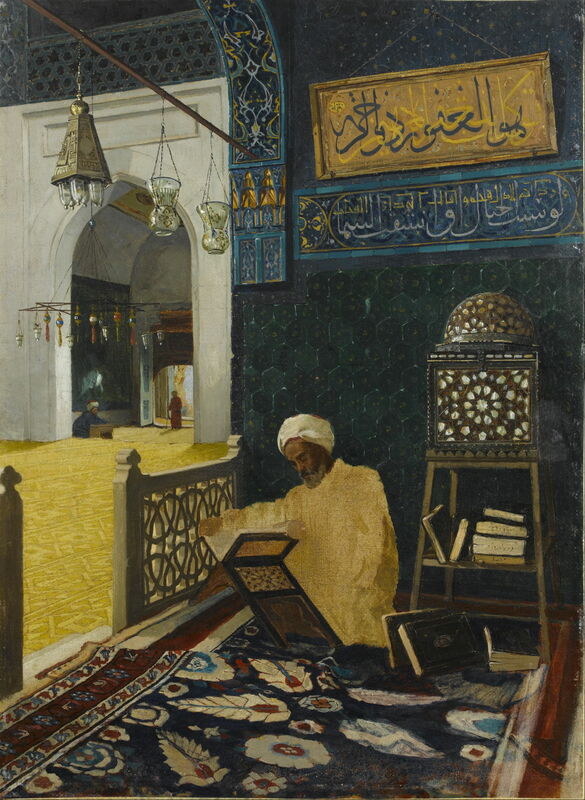 Reciting the Quran (1910) is another fine example of Hamdi Bey’s calligraphic paintings within a painting, and is noticeably looser than his earlier work. When he died in 1910, Osman Hamdi Bey left Turkey much better able to foster the talents of young artists, to train them, and to help their careers. He had ensured that the nation’s cultural and artistic heritage was far better protected, and made accessible in major museums. 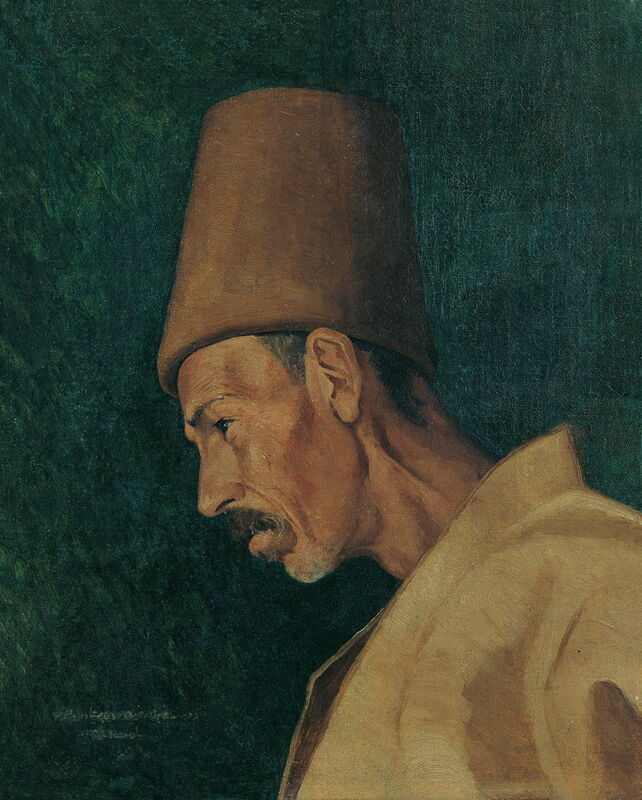 When younger artists, like the Impressionist Nazmi Ziya Güran (1881-1937), returned from Paris, they benefitted from Osman Hamdi Bey’s legacy and foresight. Posted in General, Painting and tagged Bey, Gérôme, Hamdi Bey, painting. Bookmark the permalink.